Having mentioned the effect disparity plays on determining the league champions in previous posts I thought it would be interesting to look at the actual levels of disparity currently present in football. I started off looking at the English Premier League (EPL) over the past decade and plotted the points achieved each season as a Tukey Box-and-Whiskers plot (Figure 1). Looking at Figure 1, the spread of points across the league each season is broadly consistent. There have been a few years where individual teams have done particularly well, such as Chelsea in 2004-2005, or particularly badly, such as Derby County in 2008, but there are no obvious changes over time. One noticeable feature, however, is that the median value for every season (the thick black line in the middle of each box) is lower than the overall average (plotted as the horizontal dotted line), suggesting the data is skewed. 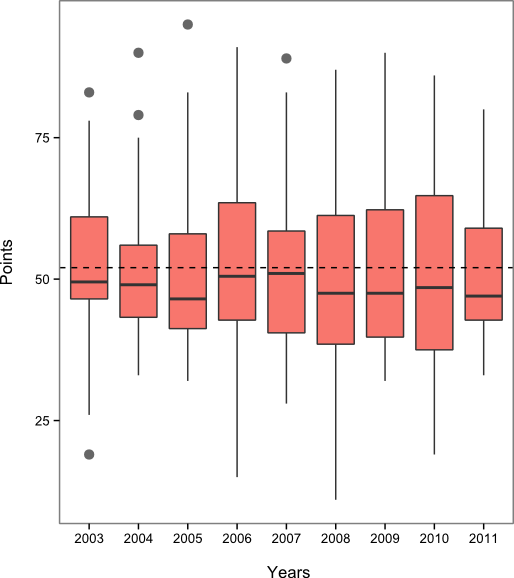 Looking at the 2010–2011 season as an example, half the teams scored less than 47 points while half scored 47 or more. In comparison, the average points scored that season was 51.5. This means that an average mid-table EPL team is closer to relegation than it is to winning the league. To put it into perspective, West Ham finished bottom that season scoring just 18.5 points less than the average while Manchester United won the league with 28.5 points more than the average. A similar pattern can be seen across all the major league in Europe (Figure 2) where the median points achieved was also lower than the average. 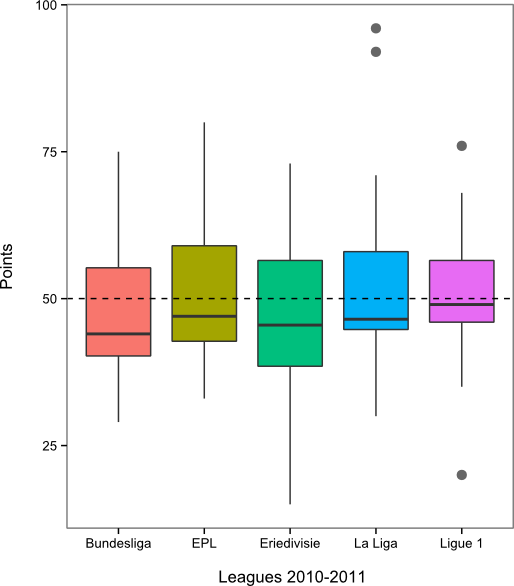 The median points for the Budesliga and Eriedivise were furthest from the average but it is worth bearing in mind that these two league player fewer matches than the EPL, La Liga and Ligue 1 so this is perhaps to be expected. La Liga and Ligue 1 both show two teams that are classified as statistical outliers. It is no surprise that the two outliers in La Liga are Real Madrid and Barcelona who both finished more than twenty points ahead of the rest of the league. In the case of Ligue 1, the champions Montpellier and relegated Arles-Avignon are both classed as outliers. A major the reason for this is how close the middle of Ligue 1 finished that season – Monaco were relegated with 44 points, only seven points less than Bordeux who finished in seventh place. Since leagues play different numbers of matches it is difficult to compare them directly so I also looked at the difference in points scored per match by the top team and the middle team, and the middle team and bottom team (Table 1). The results show that La Liga was the most uncompetitive of the leagues, with the champions scoring 1.737 points more per match than the bottom team. The EPL came out as the most competitive league, with the lowest difference between the top and bottom teams. However, Ligue 1 appears the most balanced, with the smallest difference between the top and bottom of the league compared with the middle. Interestingly, the Eriedivisie appears unbalanced in the opposite way to most other leagues, with the bottom team further away from mid-table than the champions are from mid-table.